Get ready to fall in love! 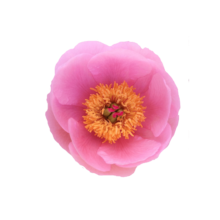 Paeonia Soft Salmon Saucer is an incredibly elegant and charming peony with flowers that have a lovely, subdued colour. No, this variety doesn’t try to win you over with flashy colours or strong fragrances. Soft Salmon Saucer is all about subtlety. Soft Salmon is a single-flowered peony variety. The flowers are filled with golden yellow stamens and its petals vary in colour between salmon and light pink. A wonderful combination of colours that will be hard to forget. The stems of Soft Salmon Saucer are strong and the leaves are beautiful green and firm. The flowers vary in size and are about 12 to 16 centimeters wide. Paeonia Soft Salmon Saucer was bred in 1968 and registered in 1981 by American breeders Lyman Cousins and Roy Klehm.